Comet the Snow Dog // 12x12 Challenge Layout - Glitter! Hello friends! It's a new month and therefore a new challenge will be up on The Young Scrappers! Woohoo! This month's theme is another inspiration board that features a lot of glitter! We hope you can take the plunge this month and come on over and join us. Below is the inspiration that Marloes made! You can find her blog over on The Dutch Scrapper! My take on this challenge was another layout. Since people often think of glitter as a girly type of embellishment, I decided to use it on a slightly more manly layout. This layout features a photo of my lovely dog named Comet. The background paper for this layout is from Oriental Trading and is a fun gray wood grain pattern. I then used some black cardstock to mat my photo and then I decided to pull out my Heidi Swapp for Project Life Sparkle Kit. As for the glitter portion of this challenge, I incorporated it in three different ways (kinda). The gold Heidi Swapp Color Shine really adds the finishing touch to this page. The other two portions of glitter are picked up from the gold chipboard and the gold strips from the Project Life card. The title section is made up of everything from the Oriental Trading sticker sheet except for the white foam Thickers (Rockabye foam letters). And that pretty much sums it up! There is also a border sticker from the Oriental Trading at the bottom of this little. 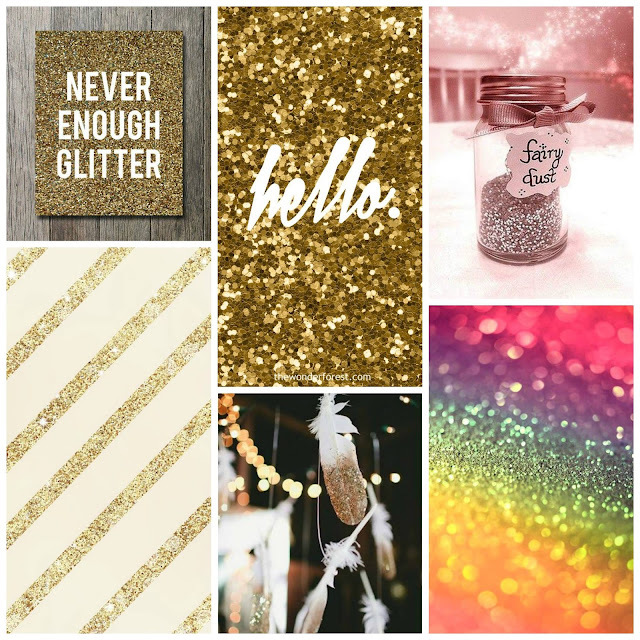 I hope you come and join us for our glitter challenge!